I find it surprising that this movie, although not a “real war movie”, didn’t even get the tag “war” despite the fact that civil war is a major topic. 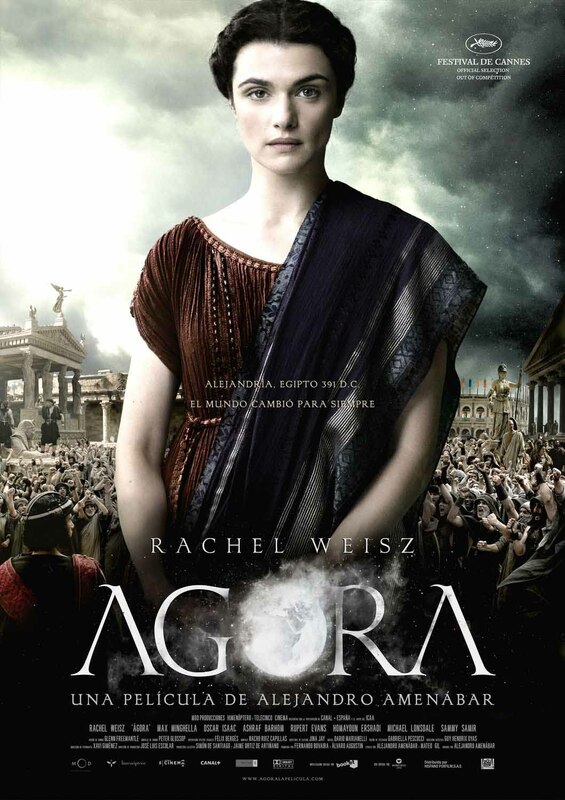 I had meant to watch Agora a long time ago although I read many mixed reviews. Now that I have finally seen it I can see why. It is a flawed movie, it is the victim of silly marketing as well as the victim of what I think is a bad and misleading title. All this said I still think it is excellent and how many times do I have nightmares after having watched a movie? And, yes, Agora, woke me, it woke me because the story it tells – and which is a true story – is deeply upsetting for many reasons. 391 A.D. Alexandria. The Roman Empire is in decline. The philosopher, astronomer and mathematician Hypatia is an influential figure in the city. She teaches and does research. One of her main topics is the movement of the planets. She wonders whether the sun is really moving around the earth. Her lectures are lively and interactive. She doesn’t mind being contradicted but she wants to hear reasons, well formulated thoughts. It seems she was an attractive woman and some of her pupils are in love with her. She doesn’t want to get married, her life is dedicated to philosophy and research. The city of Alexandria is composed of different people, Jews and Christians and of course, the so-called heathens, like Hypatia herself. The Christian movement which is not more than a sect is becoming more and more influential and finally a civil war breaks out during which the famous library of Alexandria is burned down and the Christians, led by their bishops, take over the city. Hypatia is tolerated but not allowed to teach anymore. The longer the Christians are in charge and when they finally also start to persecute the Jews, she is in danger as well. It isn’t liked that she insists upon the fact that the earth circles around the sun and not the other way around. And worse than that, it’s not tolerated anymore that a woman occupies an influential position. Her end is famous and extremely gruesome. The trailer and some of the movie posters make us believe that we will watch a romance. While there are men in love with Hypatia we do not see any love stories but in order to make her ending more acceptable for sensitive movie goers this aspect plays into it. Before she is killed, Hypatia is accused of witchcraft and the bishops insist that women are to be subjugated by men. All the reasons for this are taken from the bible and the fact that Jesus had 12 male apostles but no woman serves as another proof. After having watched this and done a bit of research on Hypatia I must say that she was a truly amazing woman. She had found out with very primitive methods (nicely shown in the movie), that the earth isn’t the center of the universe. We know how long it took until this was rediscovered and how long the Catholic Church fought this discovery. I think it would have been justified to call this movie Hypatia and not Agora. Yes, it’s about the end of an era but more than that it is about a woman and the war against women that still rages in many countries. Religious fanaticism, no matter the origin, is something that upsets me and one group of people oppressing another group does upset me as well. The combination of topics in this movie make it topical and many elements are as explosive today as they were then. I’m not much of a Rachel Weisz fan but she is convincing in this role. I have only seen one other of Amenabár’s movies The Others which I liked but I haven’t seen his highly acclaimed Mar adentro – The Sea Inside. After having watched Agora, I’m keen on watching other movies by him. I am fascinated by this story and would love to read a book about this period and Hypatia. Does anyone have a suggestion? This entry was posted in Reviews, Roman Empire, Trailer, Women in War Movies and tagged Agora, Alejandro Amenábar, Alexandria, History, Hypatia, Mar adentro, Movies, Rachel Weisz, Reviews, Roman Empire, Spanish movie, The Others, The Sea Inside, Trailer, War against Women, Women in War Movies. You did not make a case for why this is a war movie. I agree that Hypatia would be a much better title. Why would they not do that? I do not cover this area of history so I can not help with recommendations. Sorry. I had never heard of her. I will look her up now. Thanks. I thought it was justified to include it because it is about a civil war and we see quite a lot of fighting. I’ve included other movies on civil wars. It really depends where you draw the line. I’m disgusted how violent those early Christinas were. I thought they only started to be so aggressive in the Middle Ages. The extermintion of the Jews, the witch hunt… All so upsetting. Tell me if you see a good book. I just read another article on her and they have taken a lot of liberties reagarding the historical facts. The library was burned much later and not by the Christians. The depiction of her fate seems quite accurate. Took liberties – imagine that! Considerable ones. Her story seems pretty accurate apart from the end. Thanks for the review. I agree Agora was a flawed film, but I still enjoyed it. I did a series of “reel vs. real” posts looking at the history behind the film on my blog. Hypatia is a fascinating woman, but the primary sources on her are sparse. The best modern biographies I’ve found are Hypatia of Alexandria by Marie Dzielska (Harvard University Press, 1995) and Hypatia of Alexandria: Mathematician and Martyr by Michael A. B. Deakin (Prometheus Books, 2007). I’ve reviewed both books on my blog and recommend both. There are some fictional accounts out there. Hypatia is a major character in my own novel. Good luck! Thank you so much for your comment and the suggestions. I found Deakin’s book meanwhile and thought it looks interesting. I will visit your blog shortly. I’m very interested in the reet v real. I thought she would be a great character for a novel. The story is fascinating, hope you will like it. The photography is pretty, and it’s rather entertaining. Otherwise, I’d say it looks like the pages of a 2nd grade History book of the 50’s – it’s a political fairytale. This doesn’t bother me in peplums shot decades ago – actually, it says something about the mentalities of moviegoers at the time. But that such techniques should be used now appalls me. PS : I love The Others as well. I’m not sure which techniques you are referring to. I really liked the story as I wasn’t familiar with it. It’s flawed, yes but it made a strong impression. Guess it did remind me of a few things. Well, let’s consider the feminist angle for instance. As you aptly reviewed, the ‘Christians’ appear as complete sexists bigots by today’s standards. But apart from a few hints at the beginning, the idea that the ruling aristocracy were probably just as sexist isn’t developed at all. This is what I call a political fairytale. The same treatment is applied to the scientific angle, and to the political (the politics of the time) angle. I didn’t find the lack of women in the movie unrealistic. She wasn’t a “typical” woman and her occupation probably led to that. It’s realistic from my point of view but maybe not from a historical point of view. I don’t know. I have meanwhile found an essay on her which I would like to read soon.